What Are Your Favorite Automotive Doppelgängers? Have you ever seen a photo of a bunch of people, and picked yourself out in it, only to find out it's not you, just some creepy dude/she-dude that looks just like you? Sure you have. This happens with cars, too, sometimes. So what are your favorite two cars that, sharing no common development, end up remarkably alike? I mean, if you have to populate a planet with billions of people and even more billions of things, you have to figure at some point nature will get lazy and just crank out a few copies, right? Who's going to notice these doppelgängers? You, that's who. There's a lot of reasons why this could happen, but the idea of convergent evolution is right up there. If two cars are filling the same basic niche, it's not surprising that they may end up quite similar. For me, the most striking pair of doppelgängers have to be the BMW 700 series and the VW Type III series. 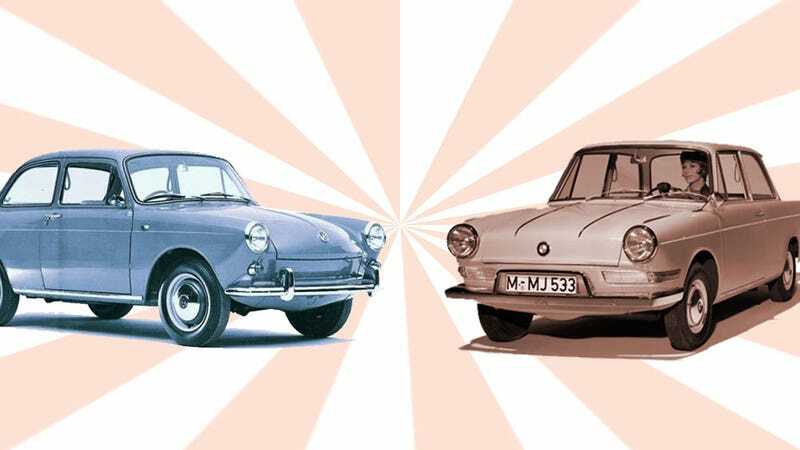 They share no common platform or development save a country of origin, they're both rear-mounthed, air-cooled, opposed-engine cars, and both were attempts to make a slightly more upmarket version of bread-and-butter basic cars. But, damn, they look a hell of a lot alike. So, out with it — what are your favorite drivable doppelgängers?